The first ten days of registration – May 1-May 10 – will be open to current dues-paying ROOTS members ONLY. Following this members-only period, if there are available spaces, registration will be open to non-members on May 11. Although registration is open to members during the entire period, we encourage all members to register during the members-only period. Space at ROOTS Week is limited, and once we are full we will close registration. Ensure your spot at ROOTS Week by registering early! EVERYONE attending ROOTS Week – even babies and young children! – must be registered individually. Accommodations are limited, and to make sure attendees are as comfortable as possible, we need to have an accurate headcount of who will be staying on campus at Lutheridge. ROOTS Week is All About Inclusivity! EVERYONE is welcome at ROOTS Week. It is the mission of Alternate ROOTS to strive to be allies in the elimination of all forms of oppression, and we cultivate an intentionally diverse and inclusive community. We embrace all people – across race, gender, sexuality, religion, immigration status, ability, or any other marginalized identity. We actively resist racism, sexism, homophobia, transphobia, Islamophobia, and all other forms of oppression. We want you to bring your whole self to ROOTS Week! Please be prepared to take whatever space and/or seek whatever individual counsel you may need before and during ROOTS Week to be “respectfully responsible” for your own work as an ally in our collective liberation. Pay ALL You Can: For the past two years, ROOTS Week has had a “Pay WHAT You Can” policy to ensure maximum participation, regardless of financial means. This year, we’re reframing this as “Pay ALL You Can” – an invitation to generosity and the sharing of resources. If you have less, there are a set number of tickets available at the lower end of the fee spectrum. If you have more, we ask you to pay more – choosing the $350, $500, or $750 option. It feels good to give as you are able and strengthens our community of spirit! 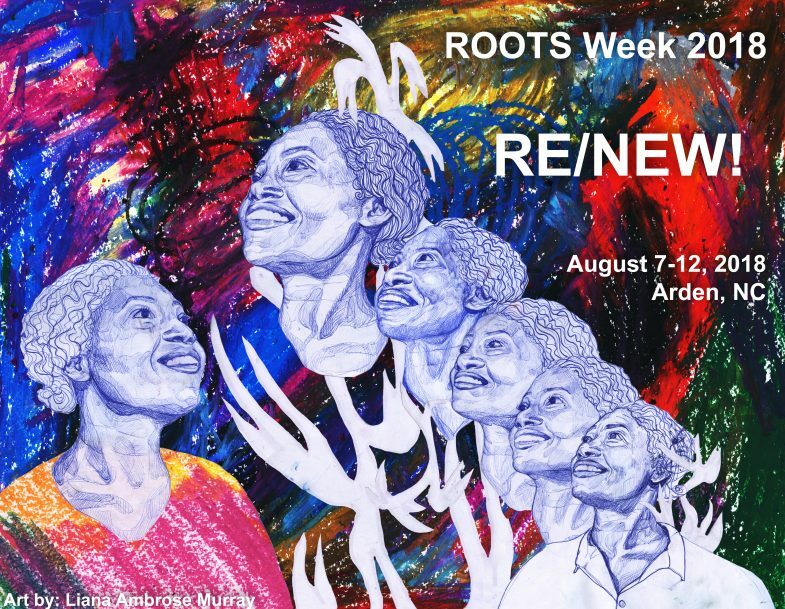 Set Number of Tickets at Each Price: When you register for ROOTS Week you’ll be asked to choose from among five ticket prices: $25, $125, $350, $500, and $750. At each of these prices, there will have a limited number of tickets available. This is where Pay ALL You Can comes into play: when choosing what price to pay, we ask that you honestly consider your financial means and keep in mind that when you choose a higher ticket price, you’re ensuring that the lower priced tickets are available to more folks. On-campus ROOTS Week tickets are all-inclusive – they cover registration, lodging, food for the week; their true cost is $750. We’ll still be accepting payment plans, so you can put a deposit down when you register, and make your final payment in July. As we gather at ROOTS Week to focus on Class and Power, we’re doing our best to balance the financial accessibility of ROOTS Week with the need to financially sustain ROOTS for years to come. We hope that the Pay ALL You Can model is in the sweet spot between both those needs. If you have questions, or need financial support regarding registration, please contact Paige Heurtin at paige@alternateroots.org or 404-577-1079. As noted above, we will have a set number of registration prices at each of the following levels: $25, $125, $350, $500, and $750. The weekly rate includes lodging, 3 meals/day, and access to all ROOTS Week programming. Arrival: on your day of arrival, you are welcome to arrive as early as 9 AM but rooms will not be available until 3 PM. Departure: on your final day, you will need to be checked out of your room by 11 AM. If you will be bringing a group of 6 or more for the day, we ask that your register in advance so that the kitchen can accommodate you. Because ROOTS Week registration fees are already heavily subsidized, we do not offer group rates. A $25 non-refundable deposit is required in order to complete registration. This $25 deposit is non-refundable. In the event of cancellation or if you do not pay your balance in full by July 6, it will not be returned to you. A $100 deposit is required in order to complete registration. $25 of this deposit is non-refundable. If you cancel on or before July 6, $75 of this fee will be returned to you within 14 days. Everyone is required to make a non-refundable deposit at registration. In addition to this deposit, you are welcome to pay your fees in full at the time of registration. If this is not possible, you have until July 6 at 5 PM EST to complete your payments. If your payment is not complete by this date, your registration will be cancelled and your spot will be given to someone on the waitlist. Please contact Paige at paige@alternateroots.org to request any special payment arrangements. Please notify ROOTS staff as soon as possible if you must cancel so that we can notify people on the waitlist. Before July 6: if you must cancel your registration, any fees paid over $25 will be returned to you within 14 business days. After July 6: if you must cancel your registration, you will be refunded only 25% of what you’ve paid beyond the $25 non-refundable deposit. ROOTS Week registration fees can be paid online, via credit card. If you encounter problems when paying online, please email paige@alternateroots.org. Registration fees, subsidies, and complimentary registrations are non-transferable. Individuals can register on-site for day attendance but on-site housing will not be guaranteed, and is VERY unlikely. If possible, please contact the ROOTS office at least 24 hours in advance to let us know you will be registering on-site. Once registration is full, any additional registrants’ names will be put on a waitlist and will be contacted with further information. There is no deposit required for the waitlist. If someone on the waitlist is offered a spot after July 6, registration must be paid in full. If this is not possible, the spot will be offered to the next person on the waitlist.